Genetically modified crops (GM crops or biotech crops) are plants used in agriculture, the DNA of which has been modified using genetic engineering methods. In most cases, the aim is to introduce a new trait to the plant which does not occur naturally in the species. Examples in food crops include resistance to certain pests, diseases, environmental conditions, reduction of spoilage, resistance to chemical treatments (e.g. resistance to a herbicide), or improving the nutrient profile of the crop. Examples in non-food crops include production of pharmaceutical agents, biofuels, and other industrially useful goods, as well as for bioremediation. Farmers have widely adopted GM technology. Acreage increased from 1.7 million hectares in 1996 to 185.1 million hectares in 2016, some 12% of global cropland. As of 2016, major crop (soybean, maize, canola and cotton) traits consist of herbicide tolerance (95.9 million hectares) insect resistance (25.2 million hectares), or both (58.5 million hectares). In 2015, 53.6 million ha of GM maize were under cultivation (almost 1/3 of the maize crop). GM maize outperformed its predecessors: yield was 5.6 to 24.5% higher with less mycotoxins (−28.8%), fumonisin (−30.6%) and thricotecens (−36.5%). Non-target organisms were unaffected, except for Braconidae, represented by a parasitoid of European corn borer, the target of Lepidoptera active Bt maize. Biogeochemical parameters such as lignin content did not vary, while biomass decomposition was higher. A 2014 meta-analysis concluded that GM technology adoption had reduced chemical pesticide use by 37%, increased crop yields by 22%, and increased farmer profits by 68%. This reduction in pesticide use has been ecologically beneficial, but benefits may be reduced by overuse. Yield gains and pesticide reductions are larger for insect-resistant crops than for herbicide-tolerant crops. Yield and profit gains are higher in developing countries than in developed countries. However, opponents have objected to GM crops on grounds including environmental impacts, food safety, whether GM crops are needed to address food needs, whether they are sufficiently accessible to farmers in developing countries and concerns over subjecting crops to intellectual property law. Safety concerns led 38 countries, including 19 in Europe, to officially prohibit their cultivation. Multiple natural mechanisms allow gene flow from one species to another. These occur in nature on a large scale – for example, it is one mechanism for the development of antibiotic resistance in bacteria. This is facilitated by transposons, retrotransposons, retroviruses, proviruses and other mobile genetic elements that naturally translocate DNA to new loci in a genome. Movement occurs over an evolutionary time scale. Traditional crop breeders have long introduced foreign germplasm into crops by creating novel crosses. A hybrid cereal grain was created in 1875, by crossing wheat and rye. Since then traits including dwarfing genes and rust resistance have been introduced in that manner. Plant tissue culture and deliberate mutations have enabled humans to alter the makeup of plant genomes. The term genetic engineering is applied to genetic modifications made using biotechnology. The first plant produced in that way came in 1982, an antibiotic-resistant tobacco plant. The first field trials occurred in France and the USA in 1986, using tobacco plants engineered for herbicide resistance. In 1987, Plant Genetic Systems (Ghent, Belgium), founded by Marc Van Montagu and Jeff Schell, was the first company to genetically engineer insect-resistant (tobacco) plants by incorporating genes that produced insecticidal proteins from Bacillus thuringiensis (Bt). The People's Republic of China was the first country to allow commercialized transgenic plants, introducing a virus-resistant tobacco in 1992, which was withdrawn in 1997.:3 The first genetically modified crop approved for sale in the U.S., in 1994, was the FlavrSavr tomato. It had a longer shelf life, because it took longer to soften after ripening. In 1994, the European Union approved tobacco engineered to tolerate the herbicide bromoxynil, making it the first commercially genetically engineered crop marketed in Europe. In 1995, Bt Potato was approved by the US Environmental Protection Agency, making it the country's first-pesticide producing crop. In 1995 canola with modified oil composition (Calgene), Bt maize (Ciba-Geigy), bromoxynil-tolerant cotton (Calgene), Bt cotton (Monsanto), glyphosate-tolerant soybeans (Monsanto), virus-tolerant squash (Asgrow), and additional delayed ripening tomatoes (DNAP, Zeneca/Peto and Monsanto) were approved. As of mid-1996, 35 approvals had been granted to commercially grow 8 transgenic crops and one flower crop (carnation), with 8 different traits in 6 countries plus the EU. In 2000, Vitamin A-enriched golden rice was developed, though as of 2016 it was not yet in commercial production. In 2013 the leaders of the three research teams that first applied genetic engineering to crops, Robert Fraley, Marc Van Montagu and Mary-Dell Chilton, were awarded the World Food Prize for improving the "quality, quantity or availability" of food in the world. In the US, by 2014, 94% of the planted area of soybeans, 96% of cotton and 93% of corn were genetically modified varieties. In developing countries, about 18 million farmers planted 54% of GM crops worldwide by 2013. Genetically engineered crops have genes added or removed using genetic engineering techniques, originally including gene guns, electroporation, microinjection and agrobacterium. More recently, CRISPR and TALEN offered much more precise and convenient editing techniques. Gene guns (also known as biolistics) "shoot" (direct high energy particles or radiations against) target genes into plant cells. It is the most common method. DNA is bound to tiny particles of gold or tungsten which are subsequently shot into plant tissue or single plant cells under high pressure. The accelerated particles penetrate both the cell wall and membranes. The DNA separates from the metal and is integrated into plant DNA inside the nucleus. This method has been applied successfully for many cultivated crops, especially monocots like wheat or maize, for which transformation using Agrobacterium tumefaciens has been less successful. The major disadvantage of this procedure is that serious damage can be done to the cellular tissue. Agrobacterium tumefaciens-mediated transformation is another common technique. Agrobacteria are natural plant parasites. Their natural ability to transfer genes provides another engineering method. To create a suitable environment for themselves, these Agrobacteria insert their genes into plant hosts, resulting in a proliferation of modified plant cells near the soil level (crown gall). The genetic information for tumor growth is encoded on a mobile, circular DNA fragment (plasmid). When Agrobacterium infects a plant, it transfers this T-DNA to a random site in the plant genome. When used in genetic engineering the bacterial T-DNA is removed from the bacterial plasmid and replaced with the desired foreign gene. The bacterium is a vector, enabling transportation of foreign genes into plants. This method works especially well for dicotyledonous plants like potatoes, tomatoes, and tobacco. Agrobacteria infection is less successful in crops like wheat and maize. Microinjection is used to directly inject foreign DNA into cells. Plant scientists, backed by results of modern comprehensive profiling of crop composition, point out that crops modified using GM techniques are less likely to have unintended changes than are conventionally bred crops. In research tobacco and Arabidopsis thaliana are the most frequently modified plants, due to well-developed transformation methods, easy propagation and well studied genomes. They serve as model organisms for other plant species. Transgenic plants have genes inserted into them that are derived from another species. The inserted genes can come from species within the same kingdom (plant to plant), or between kingdoms (for example, bacteria to plant). In many cases the inserted DNA has to be modified slightly in order to be correctly and efficiently expressed in the host organism. Transgenic plants are used to express proteins, like the cry toxins from B. thuringiensis, herbicide-resistant genes, antibodies, and antigens for vaccinations. A study led by the European Food Safety Authority (EFSA) also found viral genes in transgenic plants. 2 pumps in the cell wall, or by changing the leaf form or size. Plants have been engineered to exhibit bioluminescence that may become a sustainable alternative to electric lighting. Cisgenic plants are made using genes found within the same species or a closely related one, where conventional plant breeding can occur. Some breeders and scientists argue that cisgenic modification is useful for plants that are difficult to crossbreed by conventional means (such as potatoes), and that plants in the cisgenic category should not require the same regulatory scrutiny as transgenics. Genetically modified plants can also be developed using gene knockdown or gene knockout to alter the genetic makeup of a plant without incorporating genes from other plants. In 2014, Chinese researcher Gao Caixia filed patents on the creation of a strain of wheat that is resistant to powdery mildew. The strain lacks genes that encode proteins that repress defenses against the mildew. The researchers deleted all three copies of the genes from wheat's hexaploid genome. Gao used the TALENs and CRISPR gene editing tools without adding or changing any other genes. No field trials were immediately planned. The CRISPR technique has also been used by Penn State researcher Yinong Yang to modify white button mushrooms (Agaricus bisporus) to be non-browning, and by DuPont Pioneer to make a new variety of corn. With multiple trait integration, several new traits may be integrated into a new crop. In 2014, the largest review yet concluded that GM crops' effects on farming were positive. The meta-analysis considered all published English-language examinations of the agronomic and economic impacts between 1995 and March 2014 for three major GM crops: soybean, maize, and cotton. The study found that herbicide-tolerant crops have lower production costs, while for insect-resistant crops the reduced pesticide use was offset by higher seed prices, leaving overall production costs about the same. Yields increased 9% for herbicide tolerance and 25% for insect resistant varieties. Farmers who adopted GM crops made 69% higher profits than those who did not. The review found that GM crops help farmers in developing countries, increasing yields by 14 percentage points. The researchers considered some studies that were not peer-reviewed and a few that did not report sample sizes. They attempted to correct for publication bias, by considering sources beyond academic journals. The large data set allowed the study to control for potentially confounding variables such as fertilizer use. Separately, they concluded that the funding source did not influence study results. Recently, research and development has been targeted to enhancement of crops that are locally important in developing countries, such as insect-resistant cowpea for Africa and insect-resistant brinjal (eggplant). The first genetically modified crop approved for sale in the U.S. was the FlavrSavr tomato, which had a longer shelf life. First sold in 1994, FlavrSavr tomato production ceased in 1997. It is no longer on the market. In November 2014, the USDA approved a GM potato that prevents bruising. In February 2015 Arctic Apples were approved by the USDA, becoming the first genetically modified apple approved for US sale. Gene silencing was used to reduce the expression of polyphenol oxidase (PPO), thus preventing enzymatic browning of the fruit after it has been sliced open. The trait was added to Granny Smith and Golden Delicious varieties. The trait includes a bacterial antibiotic resistance gene that provides resistance to the antibiotic kanamycin. The genetic engineering involved cultivation in the presence of kanamycin, which allowed only resistant cultivars to survive. Humans consuming apples do not acquire kanamycin resistance, per arcticapple.com. The FDA approved the apples in March 2015. Plants use non-photochemical quenching (NPQ) to protect them from excessive amounts of sunlight. Plants can switch on the quenching mechanism almost instantaneously but it takes much longer for it to switch off again. During the time that it is switched off, the amount of energy that is wasted increases. A genetic modification in three genes allows to correct this (in a trial with tobacco plants). As a result, yields were 14-20% higher, in terms of the weight of the dry leaves harvested. The plants had bigger leaves, were taller and had more vigorous roots. Another improvement that can be made on the photosynthesis process (with C3 pathway plants) is on photorespiration. By inserting the C4 pathway into C3 plants, productivity may increase by as much as 50% for cereal crops, such as rice. Some GM soybeans offer improved oil profiles for processing. Camelina sativa has been modified to produce plants that accumulate high levels of oils similar to fish oils. Golden rice, developed by the International Rice Research Institute (IRRI), provides greater amounts of vitamin A targeted at reducing vitamin A deficiency. As of January 2016, golden rice has not yet been grown commercially in any country. A genetically modified cassava under development offers lower cyanogen glucosides and enhanced protein and other nutrients (called BioCassava). In November 2014, the USDA approved a potato that prevents bruising and produces less acrylamide when fried. They do not employ genes from non-potato species. The trait was added to the Russet Burbank, Ranger Russet and Atlantic varieties. Plants have been engineered to tolerate non-biological stressors, such as drought, frost, and high soil salinity. In 2011, Monsanto's DroughtGard maize became the first drought-resistant GM crop to receive US marketing approval. Drought resistance occurs by modifying the plant's genes responsible for the mechanism known as the crassulacean acid metabolism (CAM), which allows the plants to survive despite low water levels. This holds promise for water-heavy crops such as rice, wheat, soybeans and poplar to accelerate their adaptation to water-limited environments. Several salinity tolerance mechanisms have been identified in salt-tolerant crops. For example, rice, canola and tomato crops have been genetically modified to increase their tolerance to salt stress. As of 1999, the most prevalent GM trait was glyphosate-tolerance. [needs update] Glyphosate (the active ingredient in Roundup and other herbicide products) kills plants by interfering with the shikimate pathway in plants, which is essential for the synthesis of the aromatic amino acids phenylalanine, tyrosine, and tryptophan. The shikimate pathway is not present in animals, which instead obtain aromatic amino acids from their diet. More specifically, glyphosate inhibits the enzyme 5-enolpyruvylshikimate-3-phosphate synthase (EPSPS). This trait was developed because the herbicides used on grain and grass crops at the time were highly toxic and not effective against narrow-leaved weeds. Thus, developing crops that could withstand spraying with glyphosate would both reduce environmental and health risks, and give an agricultural edge to the farmer. Some micro-organisms have a version of EPSPS that is resistant to glyphosate inhibition. One of these was isolated from an Agrobacterium strain CP4 (CP4 EPSPS) that was resistant to glyphosate. The CP4 EPSPS gene was engineered for plant expression by fusing the 5' end of the gene to a chloroplast transit peptide derived from the petunia EPSPS. This transit peptide was used because it had shown previously an ability to deliver bacterial EPSPS to the chloroplasts of other plants. This CP4 EPSPS gene was cloned and transfected into soybeans. Tobacco plants have been engineered to be resistant to the herbicide bromoxynil. Crops have been commercialized that are resistant to the herbicide glufosinate, as well. Crops engineered for resistance to multiple herbicides to allow farmers to use a mixed group of two, three, or four different chemicals are under development to combat growing herbicide resistance. In October 2014 the US EPA registered Dow's Enlist Duo maize, which is genetically modified to be resistant to both glyphosate and 2,4-D, in six states. Inserting a bacterial aryloxyalkanoate dioxygenase gene, aad1 makes the corn resistant to 2,4-D. The USDA had approved maize and soybeans with the mutation in September 2014. Monsanto has requested approval for a stacked strain that is tolerant of both glyphosate and dicamba. The request includes plans for avoiding herbicide drift to other crops. Significant damage to other non-resistant crops occurred from dicamba formulations intended to reduce volatilization drifting when sprayed on resistant soybeans in 2017. The newer dicamba formulation labels specify to not spray when average wind speeds are above 10–15 miles per hour (16–24 km/h) to avoid particle drift, average wind speeds below 3 miles per hour (4.8 km/h) to avoid temperature inversions, and rain or high temperatures are in the next day forecast. However, these conditions typically only occur during June and July for a few hours at a time. Tobacco, corn, rice and some other crops have been engineered to express genes encoding for insecticidal proteins from Bacillus thuringiensis (Bt). The introduction of Bt crops during the period between 1996 and 2005 has been estimated to have reduced the total volume of insecticide active ingredient use in the United States by over 100 thousand tons. This represents a 19.4% reduction in insecticide use. In the late 1990s, a genetically modified potato that was resistant to the Colorado potato beetle was withdrawn because major buyers rejected it, fearing consumer opposition. Papaya, potatoes, and squash have been engineered to resist viral pathogens such as cucumber mosaic virus which, despite its name, infects a wide variety of plants. Virus resistant papaya were developed in response to a papaya ringspot virus (PRV) outbreak in Hawaii in the late 1990s. They incorporate PRV DNA. By 2010, 80% of Hawaiian papaya plants were genetically modified. Potatoes were engineered for resistance to potato leaf roll virus and Potato virus Y in 1998. Poor sales led to their market withdrawal after three years. Yellow squash that were resistant to at first two, then three viruses were developed, beginning in the 1990s. The viruses are watermelon, cucumber and zucchini/courgette yellow mosaic. Squash was the second GM crop to be approved by US regulators. The trait was later added to zucchini. Many strains of corn have been developed in recent years to combat the spread of Maize dwarf mosaic virus, a costly virus that causes stunted growth which is carried in Johnson grass and spread by aphid insect vectors. These strands are commercially available although the resistance is not standard among GM corn variants. In 2012, the FDA approved the first plant-produced pharmaceutical, a treatment for Gaucher's Disease. Tobacco plants have been modified to produce therapeutic antibodies. Algae is under development for use in biofuels. Researchers in Singapore were working on GM jatropha for biofuel production. Syngenta has USDA approval to market a maize trademarked Enogen that has been genetically modified to convert its starch to sugar for ethanol. Some trees have been genetically modified to either have less lignin, or to express lignin with chemically labile bonds. Lignin is the critical limiting factor when using wood to make bio-ethanol because lignin limits the accessibility of cellulose microfibrils to depolymerization by enzymes. Besides with trees, the chemically labile lignin bonds are also very useful for cereal crops such as maize, barley, and oats. Companies and labs are working on plants that can be used to make bioplastics. Potatoes that produce industrially useful starches have been developed as well. Oilseed can be modified to produce fatty acids for detergents, substitute fuels and petrochemicals. Scientists at the University of York developed a weed (Arabidopsis thaliana) that contains genes from bacteria that could clean TNT and RDX-explosive soil contaminants in 2011. 16 million hectares in the US (1.5% of the total surface) are estimated to be contaminated with TNT and RDX. However A. thaliana was not tough enough for use on military test grounds. Modifications in 2016 included switchgrass and bentgrass. Genetically modified plants have been used for bioremediation of contaminated soils. Mercury, selenium and organic pollutants such as polychlorinated biphenyls (PCBs). Marine environments are especially vulnerable since pollution such as oil spills are not containable. In addition to anthropogenic pollution, millions of tons of petroleum annually enter the marine environment from natural seepages. Despite its toxicity, a considerable fraction of petroleum oil entering marine systems is eliminated by the hydrocarbon-degrading activities of microbial communities. Particularly successful is a recently discovered group of specialists, the so-called hydrocarbonoclastic bacteria (HCCB) that may offer useful genes. Crops such as maize reproduce sexually each year. This randomizes which genes get propagated to the next generation, meaning that desirable traits can be lost. To maintain a high-quality crop, some farmers purchase seeds every year. Typically, the seed company maintains two inbred varieties and crosses them into a hybrid strain that is then sold. Related plants like sorghum and gamma grass are able to perform apomixis, a form of asexual reproduction that keeps the plant's DNA intact. This trait is apparently controlled by a single dominant gene, but traditional breeding has been unsuccessful in creating asexually-reproducing maize. Genetic engineering offers another route to this goal. Successful modification would allow farmers to replant harvested seeds that retain desirable traits, rather than relying on purchased seed. Genetic modifications to some crops also exist, which make it easier to process the crop. Also, some crops (such as tomatoes) have been genetic modified to contain no seed at all. US 1998 Commercialised 2007, production blocked 2010, resumed 2011. Colombia 2010[N 2] Greenhouse cultivation for export only. The number of USDA-approved field releases for testing grew from 4 in 1985 to 1,194 in 2002 and averaged around 800 per year thereafter. The number of sites per release and the number of gene constructs (ways that the gene of interest is packaged together with other elements) – have rapidly increased since 2005. Releases with agronomic properties (such as drought resistance) jumped from 1,043 in 2005 to 5,190 in 2013. As of September 2013, about 7,800 releases had been approved for corn, more than 2,200 for soybeans, more than 1,100 for cotton, and about 900 for potatoes. Releases were approved for herbicide tolerance (6,772 releases), insect resistance (4,809), product quality such as flavor or nutrition (4,896), agronomic properties like drought resistance (5,190), and virus/fungal resistance (2,616). The institutions with the most authorized field releases include Monsanto with 6,782, Pioneer/DuPont with 1,405, Syngenta with 565, and USDA’s Agricultural Research Service with 370. As of September 2013 USDA had received proposals for releasing GM rice, squash, plum, rose, tobacco, flax, and chicory. Constant exposure to a toxin creates evolutionary pressure for pests resistant to that toxin. Over-reliance on glyphosate and a reduction in the diversity of weed management practices allowed the spread of glyphosate resistance in 14 weed species in the US, and in soybeans. To reduce resistance to Bacillus thuringiensis (Bt) crops, the 1996 commercialization of transgenic cotton and maize came with a management strategy to prevent insects from becoming resistant. Insect resistance management plans are mandatory for Bt crops. The aim is to encourage a large population of pests so that any (recessive) resistance genes are diluted within the population. Resistance lowers evolutionary fitness in the absence of the stressor, Bt. In refuges, non-resistant strains outcompete resistant ones. With sufficiently high levels of transgene expression, nearly all of the heterozygotes (S/s), i.e., the largest segment of the pest population carrying a resistance allele, will be killed before maturation, thus preventing transmission of the resistance gene to their progeny. Refuges (i. e., fields of nontransgenic plants) adjacent to transgenic fields increases the likelihood that homozygous resistant (s/s) individuals and any surviving heterozygotes will mate with susceptible (S/S) individuals from the refuge, instead of with other individuals carrying the resistance allele. As a result, the resistance gene frequency in the population remains lower. Complicating factors can affect the success of the high-dose/refuge strategy. For example, if the temperature is not ideal, thermal stress can lower Bt toxin production and leave the plant more susceptible. More importantly, reduced late-season expression has been documented, possibly resulting from DNA methylation of the promoter. The success of the high-dose/refuge strategy has successfully maintained the value of Bt crops. This success has depended on factors independent of management strategy, including low initial resistance allele frequencies, fitness costs associated with resistance, and the abundance of non-Bt host plants outside the refuges. Companies that produce Bt seed are introducing strains with multiple Bt proteins. Monsanto did this with Bt cotton in India, where the product was rapidly adopted. Monsanto has also; in an attempt to simplify the process of implementing refuges in fields to comply with Insect Resistance Management(IRM) policies and prevent irresponsible planting practices; begun marketing seed bags with a set proportion of refuge (non-transgenic) seeds mixed in with the Bt seeds being sold. Coined "Refuge-In-a-Bag" (RIB), this practice is intended to increase farmer compliance with refuge requirements and reduce additional labor needed at planting from having separate Bt and refuge seed bags on hand. This strategy is likely to reduce the likelihood of Bt-resistance occurring for corn rootworm, but may increase the risk of resistance for lepidopteran corn pests, such as European corn borer. Increased concerns for resistance with seed mixtures include partially resistant larvae on a Bt plant being able to move to a susceptible plant to survive or cross pollination of refuge pollen on to Bt plants that can lower the amount of Bt expressed in kernels for ear feeding insects. Best management practices (BMPs) to control weeds may help delay resistance. BMPs include applying multiple herbicides with different modes of action, rotating crops, planting weed-free seed, scouting fields routinely, cleaning equipment to reduce the transmission of weeds to other fields, and maintaining field borders. The most widely planted GM crops are designed to tolerate herbicides. By 2006 some weed populations had evolved to tolerate some of the same herbicides. Palmer amaranth is a weed that competes with cotton. A native of the southwestern US, it traveled east and was first found resistant to glyphosate in 2006, less than 10 years after GM cotton was introduced. Farmers generally use less insecticide when they plant Bt-resistant crops. Insecticide use on corn farms declined from 0.21 pound per planted acre in 1995 to 0.02 pound in 2010. This is consistent with the decline in European corn borer populations as a direct result of Bt corn and cotton. The establishment of minimum refuge requirements helped delay the evolution of Bt resistance. However, resistance appears to be developing to some Bt traits in some areas. By leaving at least 30% of crop residue on the soil surface from harvest through planting, conservation tillage reduces soil erosion from wind and water, increases water retention, and reduces soil degradation as well as water and chemical runoff. In addition, conservation tillage reduces the carbon footprint of agriculture. A 2014 review covering 12 states from 1996 to 2006, found that a 1% increase in herbicde-tolerant (HT) soybean adoption leads to a 0.21% increase in conservation tillage and a 0.3% decrease in quality-adjusted herbicide use. The regulation of genetic engineering concerns the approaches taken by governments to assess and manage the risks associated with the development and release of genetically modified crops. There are differences in the regulation of GM crops between countries, with some of the most marked differences occurring between the US and Europe. Regulation varies in a given country depending on the intended use of each product. For example, a crop not intended for food use is generally not reviewed by authorities responsible for food safety. In 2013, GM crops were planted in 27 countries; 19 were developing countries and 8 were developed countries. 2013 was the second year in which developing countries grew a majority (54%) of the total GM harvest. 18 million farmers grew GM crops; around 90% were small-holding farmers in developing countries. The United States Department of Agriculture (USDA) reports every year on the total area of GM crop varieties planted in the United States. According to National Agricultural Statistics Service, the states published in these tables represent 81–86 percent of all corn planted area, 88–90 percent of all soybean planted area, and 81–93 percent of all upland cotton planted area (depending on the year). Global estimates are produced by the International Service for the Acquisition of Agri-biotech Applications (ISAAA) and can be found in their annual reports, "Global Status of Commercialized Transgenic Crops". Farmers have widely adopted GM technology (see figure). Between 1996 and 2013, the total surface area of land cultivated with GM crops increased by a factor of 100, from 17,000 square kilometers (4,200,000 acres) to 1,750,000 km2 (432 million acres). 10% of the world's arable land was planted with GM crops in 2010. As of 2011, 11 different transgenic crops were grown commercially on 395 million acres (160 million hectares) in 29 countries such as the US, Brazil, Argentina, India, Canada, China, Paraguay, Pakistan, South Africa, Uruguay, Bolivia, Australia, Philippines, Myanmar, Burkina Faso, Mexico and Spain. One of the key reasons for this widespread adoption is the perceived economic benefit the technology brings to farmers. For example, the system of planting glyphosate-resistant seed and then applying glyphosate once plants emerged provided farmers with the opportunity to dramatically increase the yield from a given plot of land, since this allowed them to plant rows closer together. Without it, farmers had to plant rows far enough apart to control post-emergent weeds with mechanical tillage. Likewise, using Bt seeds means that farmers do not have to purchase insecticides, and then invest time, fuel, and equipment in applying them. However critics have disputed whether yields are higher and whether chemical use is less, with GM crops. See Genetically modified food controversies article for information. Land area used for genetically modified crops by country (1996–2009), in millions of hectares. In 2011, the land area used was 160 million hectares, or 1.6 million square kilometers. In the US, by 2014, 94% of the planted area of soybeans, 96% of cotton and 93% of corn were genetically modified varieties. Genetically modified soybeans carried herbicide-tolerant traits only, but maize and cotton carried both herbicide tolerance and insect protection traits (the latter largely Bt protein). These constitute "input-traits" that are aimed to financially benefit the producers, but may have indirect environmental benefits and cost benefits to consumers. The Grocery Manufacturers of America estimated in 2003 that 70–75% of all processed foods in the U.S. contained a GM ingredient. Europe grows relatively few genetically engineered crops with the exception of Spain, where one fifth of maize is genetically engineered, and smaller amounts in five other countries. The EU had a 'de facto' ban on the approval of new GM crops, from 1999 until 2004. GM crops are now regulated by the EU. In 2015, genetically engineered crops are banned in 38 countries worldwide, 19 of them in Europe. Developing countries grew 54 percent of genetically engineered crops in 2013. In recent years GM crops expanded rapidly in developing countries. In 2013 approximately 18 million farmers grew 54% of worldwide GM crops in developing countries. 2013's largest increase was in Brazil (403,000 km2 versus 368,000 km2 in 2012). GM cotton began growing in India in 2002, reaching 110,000 km2 in 2013. According to the 2013 ISAAA brief: "...a total of 36 countries (35 + EU-28) have granted regulatory approvals for biotech crops for food and/or feed use and for environmental release or planting since 1994... a total of 2,833 regulatory approvals involving 27 GM crops and 336 GM events (NB: an "event" is a specific genetic modification in a specific species) have been issued by authorities, of which 1,321 are for food use (direct use or processing), 918 for feed use (direct use or processing) and 599 for environmental release or planting. Japan has the largest number (198), followed by the U.S.A. (165, not including "stacked" events), Canada (146), Mexico (131), South Korea (103), Australia (93), New Zealand (83), European Union (71 including approvals that have expired or under renewal process), Philippines (68), Taiwan (65), Colombia (59), China (55) and South Africa (52). Maize has the largest number (130 events in 27 countries), followed by cotton (49 events in 22 countries), potato (31 events in 10 countries), canola (30 events in 12 countries) and soybean (27 events in 26 countries). Direct genetic engineering has been controversial since its introduction. Most, but not all of the controversies are over GM foods rather than crops per se. GM foods are the subject of protests, vandalism, referenda, legislation, court action and scientific disputes. The controversies involve consumers, biotechnology companies, governmental regulators, non-governmental organizations and scientists. Opponents have objected to GM crops on multiple grounds including environmental impacts, food safety, whether GM crops are needed to address food needs, whether they are sufficiently accessible to farmers in developing countries and concerns over subjecting crops to intellectual property law. Secondary issues include labeling, the behavior of government regulators, the effects of pesticide use and pesticide tolerance. A significant environmental concern about using genetically modified crops is possible cross-breeding with related crops, giving them advantages over naturally occurring varieties. One example is a glyphosate-resistant rice crop that crossbreeds with a weedy relative, giving the weed a competitive advantage. The transgenic hybrid had higher rates of photosynthesis, more shoots and flowers, and more seeds than the non-transgenic hybrids. This demonstrates the possibility of ecosystem damage by GM crop usage. No reports of ill effects from GM food have been documented in the human population. GM crop labeling is required in many countries, although the United States Food and Drug Administration does not, nor does it distinguish between approved GM and non-GM foods. The United States enacted a law that requires labeling regulations to be issued by July 2018. It allows indirect disclosure such as with a phone number, bar code, or web site. Advocacy groups such as Center for Food Safety, Union of Concerned Scientists, Greenpeace and the World Wildlife Fund claim that risks related to GM food have not been adequately examined and managed, that GM crops are not sufficiently tested and should be labelled, and that regulatory authorities and scientific bodies are too closely tied to industry. Some studies have claimed that genetically modified crops can cause harm; a 2016 review that reanalyzed the data from six of these studies found that their statistical methodologies were flawed and did not demonstrate harm, and said that conclusions about GM crop safety should be drawn from "the totality of the evidence... instead of far-fetched evidence from single studies". ^ a b Pellegrino, Elisa; Bedini, Stefano; Nuti, Marco; Ercoli, Laura (15 February 2018). "Impact of genetically engineered maize on agronomic, environmental and toxicological traits: a meta-analysis of 21 years of field data". Scientific Reports. 8 (1): 3113. Bibcode:2018NatSR...8.3113P. doi:10.1038/s41598-018-21284-2. ISSN 2045-2322. PMC 5814441. PMID 29449686. ^ a b c Klümper, W; Qaim, M (2014). "A Meta-Analysis of the Impacts of Genetically Modified Crops". PLoS ONE. 9 (11): e111629. Bibcode:2014PLoSO...9k1629K. doi:10.1371/journal.pone.0111629. PMC 4218791. PMID 25365303. ^ a b Perry, E. D; Ciliberto, F; Hennessy, D. A; Moschini, G (2016). "Genetically engineered crops and pesticide use in U.S. Maize and soybeans". Science Advances. 2 (8): e1600850. doi:10.1126/sciadv.1600850. PMID 27652335. ^ a b Nicolia, Alessandro; Manzo, Alberto; Veronesi, Fabio; Rosellini, Daniele (2013). "An overview of the last 10 years of genetically engineered crop safety research" (PDF). Critical Reviews in Biotechnology. 34 (1): 1–12. doi:10.3109/07388551.2013.823595. PMID 24041244. Archived from the original (PDF) on 17 September 2016. Retrieved 8 July 2016. We have reviewed the scientific literature on GE crop safety for the last 10 years that catches the scientific consensus matured since GE plants became widely cultivated worldwide, and we can conclude that the scientific research conducted so far has not detected any significant hazard directly connected with the use of GM crops. ^ a b Ronald, Pamela (5 May 2011). "Plant Genetics, Sustainable Agriculture and Global Food Security". Genetics. 188 (1): 11–20. doi:10.1534/genetics.111.128553. PMC 3120150. PMID 21546547. There is broad scientific consensus that genetically engineered crops currently on the market are safe to eat. After 14 years of cultivation and a cumulative total of 2 billion acres planted, no adverse health or environmental effects have resulted from commercialization of genetically engineered crops (Board on Agriculture and Natural Resources, Committee on Environmental Impacts Associated with Commercialization of Transgenic Plants, National Research Council and Division on Earth and Life Studies 2002). Both the U.S. National Research Council and the Joint Research Centre (the European Union's scientific and technical research laboratory and an integral part of the European Commission) have concluded that there is a comprehensive body of knowledge that adequately addresses the food safety issue of genetically engineered crops (Committee on Identifying and Assessing Unintended Effects of Genetically Engineered Foods on Human Health and National Research Council 2004; European Commission Joint Research Centre 2008). These and other recent reports conclude that the processes of genetic engineering and conventional breeding are no different in terms of unintended consequences to human health and the environment (European Commission Directorate-General for Research and Innovation 2010). Krimsky, Sheldon (2015). "An Illusory Consensus behind GMO Health Assessment" (PDF). Science, Technology, & Human Values. 40 (6): 1–32. doi:10.1177/0162243915598381. Archived from the original (PDF) on 7 February 2016. Retrieved 9 February 2016. I began this article with the testimonials from respected scientists that there is literally no scientific controversy over the health effects of GMOs. My investigation into the scientific literature tells another story. Panchin, Alexander Y.; Tuzhikov, Alexander I. (14 January 2016). "Published GMO studies find no evidence of harm when corrected for multiple comparisons". Critical Reviews in Biotechnology. 37 (2): 1–5. doi:10.3109/07388551.2015.1130684. ISSN 0738-8551. PMID 26767435. Here, we show that a number of articles some of which have strongly and negatively influenced the public opinion on GM crops and even provoked political actions, such as GMO embargo, share common flaws in the statistical evaluation of the data. Having accounted for these flaws, we conclude that the data presented in these articles does not provide any substantial evidence of GMO harm. ^ a b "A decade of EU-funded GMO research (2001–2010)" (PDF). Directorate-General for Research and Innovation. Biotechnologies, Agriculture, Food. European Commission, European Union. 2010. doi:10.2777/97784. ISBN 978-92-79-16344-9. Retrieved 8 February 2016. ^ a b Haslberger, Alexander G. (2003). "Codex guidelines for GM foods include the analysis of unintended effects". Nature Biotechnology. 21 (7): 739–41. doi:10.1038/nbt0703-739. PMID 12833088. These principles dictate a case-by-case premarket assessment that includes an evaluation of both direct and unintended effects. ^ a b Marris, Claire (2001). "Public views on GMOs: deconstructing the myths". EMBO Reports. 2 (7): 545–48. doi:10.1093/embo-reports/kve142. PMC 1083956. PMID 11463731. ^ a b Scott, Sydney E.; Inbar, Yoel; Rozin, Paul (2016). "Evidence for Absolute Moral Opposition to Genetically Modified Food in the United States" (PDF). Perspectives on Psychological Science. 11 (3): 315–24. doi:10.1177/1745691615621275. PMID 27217243. ^ Lederberg J, Tatum EL (1946). "Gene recombination in E. coli". Nature. 158 (4016): 558. Bibcode:1946Natur.158..558L. doi:10.1038/158558a0. ^ Bock, R. (2010). "The give-and-take of DNA: horizontal gene transfer in plants". Trends in Plant Science. 15 (1): 11–22. doi:10.1016/j.tplants.2009.10.001. PMID 19910236. ^ Morgante, M.; Brunner, S.; Pea, G.; Fengler, K.; Zuccolo, A.; Rafalski, A. (2005). "Gene duplication and exon shuffling by helitron-like transposons generate intraspecies diversity in maize". Nature Genetics. 37 (9): 997–1002. doi:10.1038/ng1615. PMID 16056225. ^ Monroe D. (2006). "Jumping Genes Cross Plant Species Boundaries". PLoS Biology. 4 (1): e35. doi:10.1371/journal.pbio.0040035. ^ Feschotte, C.; Osterlund, M. T.; Peeler, R.; Wessler, S. R. (2005). "DNA-binding specificity of rice mariner-like transposases and interactions with Stowaway MITEs". Nucleic Acids Research. 33 (7): 2153–65. doi:10.1093/nar/gki509. PMC 1079968. PMID 15831788. ^ Cordaux, R.; Udit, S.; Batzer, M.; Feschotte, C. (2006). "Birth of a chimeric primate gene by capture of the transposase gene from a mobile element". Proceedings of the National Academy of Sciences of the United States of America. 103 (21): 8101–06. Bibcode:2006PNAS..103.8101C. doi:10.1073/pnas.0601161103. PMC 1472436. PMID 16672366. ^ Long, M.; Betrán, E.; Thornton, K.; Wang, W. (2003). "The origin of new genes: glimpses from the young and old". Nature Reviews Genetics. 4 (11): 865–75. doi:10.1038/nrg1204. PMID 14634634. ^ Chen, Z. (2010). "Molecular mechanisms of polyploidy and hybrid vigor". Trends in Plant Science. 15 (2): 57–71. doi:10.1016/j.tplants.2009.12.003. PMC 2821985. PMID 20080432. ^ Hoisington D, Khairallah M, Reeves T, Ribaut JM, Skovmand B, Taba S, Warburton M (1999). "Plant genetic resources: What can they contribute toward increased crop productivity?" (PDF). Proceedings of the National Academy of Sciences of the United States of America. 96 (11): 5937–43. Bibcode:1999PNAS...96.5937H. doi:10.1073/pnas.96.11.5937. ISSN 0027-8424. PMC 34209. PMID 10339521. ^ Predieri, S. (2001). "Mutation induction and tissue culture in improving fruits". Plant Cell, Tissue and Organ Culture. 64 (2/3): 185–210. doi:10.1023/A:1010623203554. ^ Duncan, R. (1996). "Tissue Culture-Induced Variation and Crop Improvement". Advances in Agronomy. 58: 201–40. doi:10.1016/S0065-2113(08)60256-4. ISBN 9780120007585. ^ Fraley, RT; et al. (1983). "Expression of bacterial genes in plant cells" (PDF). Proc. Natl. Acad. Sci. U.S.A. 80 (15): 4803–07. Bibcode:1983PNAS...80.4803F. doi:10.1073/pnas.80.15.4803. PMC 384133. ^ Vaeck, M; et al. (1987). "Transgenic plants protected from insect attack" (PDF). Nature. 328 (6125): 33–37. Bibcode:1987Natur.328...33V. doi:10.1038/328033a0. ^ Conner, AJ; Glare, TR; Nap, JP (January 2003). "The release of genetically modified crops into the environment. Part II. Overview of ecological risk assessment". Plant J. 33 (1): 19–46. doi:10.1046/j.0960-7412.2002.001607.x. PMID 12943539. ^ a b Bruening, G.; Lyons, J. M. (2000). "The case of the FLAVR SAVR tomato". California Agriculture. 54 (4): 6–7. doi:10.3733/ca.v054n04p6. ^ Shrawat, A.; Lörz, H. (2006). "Agrobacterium-mediated transformation of cereals: a promising approach crossing barriers". Plant Biotechnology Journal. 4 (6): 575–603. doi:10.1111/j.1467-7652.2006.00209.x. PMID 17309731. ^ Catchpole, G. S.; Beckmann, M.; Enot, D. P.; Mondhe, M.; Zywicki, B.; Taylor, J.; Hardy, N.; Smith, A.; King, R. D.; Kell, D. B.; Fiehn, O.; Draper, J. (2005). "Hierarchical metabolomics demonstrates substantial compositional similarity between genetically modified and conventional potato crops" (PDF). Proceedings of the National Academy of Sciences. 102 (40): 14458–62. Bibcode:2005PNAS..10214458C. doi:10.1073/pnas.0503955102. PMC 1242293. PMID 16186495. ^ Koornneef, M.; Meinke, D. (2010). "The development of Arabidopsis as a model plant". The Plant Journal. 61 (6): 909–21. doi:10.1111/j.1365-313X.2009.04086.x. PMID 20409266. ^ a b Banjara, Manoj; Zhu, Longfu; Shen, Guoxin; Payton, Paxton; Zhang, Hong (1 January 2012). "Expression of an Arabidopsis sodium/proton antiporter gene (AtNHX1) in peanut to improve salt tolerance". Plant Biotechnology Reports. 6: 59–67. doi:10.1007/s11816-011-0200-5. Retrieved 19 December 2013. ^ Walmsley, A.; Arntzen, C. (2000). "Plants for delivery of edible vaccines". Current Opinion in Biotechnology. 11 (2): 126–29. doi:10.1016/S0958-1669(00)00070-7. PMID 10753769. ^ Nancy Podevina; Patrick du Jardin (2012). "Possible consequences of the overlap between the CaMV 35S promoter regions in plant transformation vectors used and the viral gene VI in transgenic plants". GM Crops & Food: Biotechnology in Agriculture and the Food Chain. 3 (4): 296–300. doi:10.4161/gmcr.21406. PMID 22892689. ^ Wang, Yanpeng (2014). "Simultaneous editing of three homoeoalleles in hexaploid bread wheat confers heritable resistance to powdery mildew". Nature Biotechnology. 32 (9): 947–51. doi:10.1038/nbt.2969. PMID 25038773. ^ Sun, X; Mumm, R. H (2015). "Optimized breeding strategies for multiple trait integration: III. Parameters for success in version testing". Molecular Breeding. 35 (10): 201. doi:10.1007/s11032-015-0397-z. PMC 4605974. PMID 26491398. ^ Areal, F. J.; Riesgo, L.; Rodríguez-Cerezo, E. (2012). "Economic and agronomic impact of commercialized GM crops: A meta-analysis". The Journal of Agricultural Science. 151: 7–33. doi:10.1017/S0021859612000111. ^ Finger, Robert; El Benni, Nadja; Kaphengst, Timo; Evans, Clive; Herbert, Sophie; Lehmann, Bernard; Morse, Stephen; Stupak, Nataliya (2011). "A Meta Analysis on Farm-Level Costs and Benefits of GM Crops" (PDF). Sustainability. 3 (12): 743–62. doi:10.3390/su3050743. ^ Hutchison WD, Burkness EC, Mitchell PD, Moon RD, Leslie TW, Fleischer SJ, Abrahamson M, Hamilton KL, Steffey KL, Gray ME, Hellmich RL, Kaster LV, Hunt TE, Wright RJ, Pecinovsky K, Rabaey TL, Flood BR, Raun ES (October 2010). 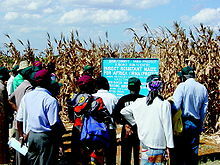 "Areawide suppression of European corn borer with Bt maize reaps savings to non-Bt maize growers". Science. 330 (6001): 222–25. Bibcode:2010Sci...330..222H. doi:10.1126/science.1190242. PMID 20929774. ^ Karnowski, Steve High-Tech Corn Fights Pests at Home and Nearby[permanent dead link] Sci-Tech today, 8 October 2010. Retrieved 9 October 2010. ^ Falck-Zepeda, José Benjamin; Traxler, Greg; Nelson, Robert G. (2000). "Surplus Distribution from the Introduction of a Biotechnology Innovation". American Journal of Agricultural Economics. 82 (2): 360–69. doi:10.1111/0002-9092.00031. JSTOR 1244657. ^ Smale, M.; P. Zambrano; M. Cartel (2006). "Bales and balance: A review of the methods used to assess the economic impact of Bt cotton on farmers in developing economies" (PDF). AgBioForum. 9 (3): 195–212. ^ a b Rajib Deb, et al. "Genetically Modified (Gm) Crops Lifeline For Livestock – A Review." Agricultural Reviews 31.4 (2010): 279–285. ^ Karki, S; Rizal, G; Quick, W. P (2013). "Improvement of photosynthesis in rice (Oryza sativa L.) by inserting the C4 pathway". Rice. 6 (1): 28. doi:10.1186/1939-8433-6-28. PMC 4883725. PMID 24280149. ^ Evans, J. R (2013). "Improving Photosynthesis". Plant Physiology. 162 (4): 1780–1793. doi:10.1104/pp.113.219006. PMC 3729760. PMID 23812345. ^ Ruiz-Lopez, Noemi; et al. (2013). "Successful high-level accumulation of fish oil omega-3 long chain polyunsaturated fatty acids in a transgenic oilseed crop". The Plant Journal. 77 (2): 198–208. doi:10.1111/tpj.12378. PMC 4253037. PMID 24308505. ^ Nayar, A. (2011). "Grants aim to fight malnutrition". Nature. doi:10.1038/news.2011.233. ^ Sayre, R.; Beeching, J. R.; Cahoon, E. B.; Egesi, C.; Fauquet, C.; Fellman, J.; Fregene, M.; Gruissem, W.; Mallowa, S.; Manary, M.; Maziya-Dixon, B.; Mbanaso, A.; Schachtman, D. P.; Siritunga, D.; Taylor, N.; Vanderschuren, H.; Zhang, P. (2011). "The BioCassava Plus Program: Biofortification of Cassava for Sub-Saharan Africa". Annual Review of Plant Biology. 62: 251–72. doi:10.1146/annurev-arplant-042110-103751. PMID 21526968. ^ G. R. Heck; et al. (1 January 2005). "Development and Characterization of a CP4 EPSPS-Based, Glyphosate-Tolerant Corn Event". Crop Sci. 45 (1): 329–39. doi:10.2135/cropsci2005.0329. Archived from the original (Free full text) on 22 August 2009. ^ T. Funke; et al. (2006). "Molecular basis for the herbicide resistance of Roundup Ready crops" (Free full text). PNAS. 103 (35): 13010–15. Bibcode:2006PNAS..10313010F. doi:10.1073/pnas.0603638103. PMC 1559744. PMID 16916934. ^ Kasey J. (8 September 2011)Attack of the Superweed[permanent dead link]. Bloomberg Businessweek. ^ Vaeck, M.; Reynaerts, A.; Höfte, H.; Jansens, S.; De Beuckeleer, M.; Dean, C.; Zabeau, M.; Montagu, M. V.; Leemans, J. (1987). "Transgenic plants protected from insect attack". Nature. 328 (6125): 33–37. Bibcode:1987Natur.328...33V. doi:10.1038/328033a0. ^ Meagher, RB (2000). "Phytoremediation of toxic elemental and organic pollutants". Current Opinion in Plant Biology. 3 (2): 153–62. doi:10.1016/S1369-5266(99)00054-0. PMID 10712958. ^ Tabashnik; et al. (2003). "Insect Resistance to Transgenic Bt Crops: Lessons from the Laboratory and Field" (PDF). J. Econ. Entomol. 96 (4): 1031–38. doi:10.1603/0022-0493-96.4.1031. PMID 14503572. Archived from the original (PDF) on 14 March 2013. ^ Roush RT (1997). "Bt-transgenic crops: just another pretty insecticide or a chance for a new start in the resistance management?". Pestic. Sci. 51 (3): 328–34. doi:10.1002/(SICI)1096-9063(199711)51:3<328::AID-PS650>3.0.CO;2-B. ^ Dong, H. Z.; Li, W. J. (2007). "Variability of Endotoxin Expression in Bt Transgenic Cotton". Journal of Agronomy & Crop Science. 193: 21–29. doi:10.1111/j.1439-037X.2006.00240.x. ^ Tabashnik BE, Carrière Y, Dennehy TJ (August 2003). "Insect resistance to transgenic Bt crops: lessons from the laboratory and field". J. Econ. Entomol. 96 (4): 1031–38. doi:10.1603/0022-0493-96.4.1031. PMID 14503572. ^ Siegfried, B.D. ; et al. (2012). "Understanding successful resistance management". GM Crops & Food. 3 (3): 184–93. doi:10.4161/gmcr.20715. ^ Devos, Y.; et al. (2013). "Resistance evolution to the first generation of genetically modified Diabrotica-active Bt-maize events by western corn rootworm: management and monitoring considerations". Transgenic Research. 22 (2): 269–99. doi:10.1007/s11248-012-9657-4. PMID 23011587. ^ Culpepper, Stanley A; et al. (2006). "Glyphosate-resistant Palmer amaranth (Amaranthus palmeri) confirmed in Georgia". Weed Science. 54 (4): 620–26. doi:10.1614/ws-06-001r.1. ^ Linda Bren (November – December 2003). "Genetic Engineering: The Future of Foods?". U.S. Food and Drug Administration. ^ Lemaux, Peggy (19 February 2008). "Genetically Engineered Plants and Foods: A Scientist's Analysis of the Issues (Part I)". Annual Review of Plant Biology. 59: 771–812. doi:10.1146/annurev.arplant.58.032806.103840. PMID 18284373. Retrieved 9 May 2009. ^ Qiu, Jane (16 August 2013). "Genetically modified crops pass benefits to weeds". Nature. doi:10.1038/nature.2013.13517. ISSN 1476-4687. ^ Key S, Ma JK, Drake PM (June 2008). "Genetically modified plants and human health". J R Soc Med. 101 (6): 290–98. doi:10.1258/jrsm.2008.070372. PMC 2408621. PMID 18515776. ^ Domingo, José L.; Bordonaba, Jordi Giné (2011). "A literature review on the safety assessment of genetically modified plants" (PDF). Environment International. 37 (4): 734–42. doi:10.1016/j.envint.2011.01.003. PMID 21296423. ^ Krimsky, Sheldon (2015). "An Illusory Consensus behind GMO Health Assessment" (PDF). Science, Technology, & Human Values. 40 (6): 1–32. doi:10.1177/0162243915598381. Archived from the original (PDF) on 7 February 2016. Retrieved 9 February 2016. ^ Panchin, Alexander Y.; Tuzhikov, Alexander I. (2016). "Published GMO studies find no evidence of harm when corrected for multiple comparisons". Critical Reviews in Biotechnology. 37 (2): 1–5. doi:10.3109/07388551.2015.1130684. PMID 26767435.